Oh baby, it’s (getting) cold outside! Which only means one thing – soup season is upon us. There’s nothing better than having nice hot soup on a chilly evening, or brightening winter lunch breaks with a warming bowl. I love soup, but sometimes feel a bit restricted in my recipes – we all know, the perfect soups take time! I recently discovered a soup maker – yes, SOUP MAKER! – and I’ve honestly never looked back. Morphy Richards have a awesome soup maker called Total Control. It lets you choose your desired soup consistency – smooth, medium or chunky – before blending up your chosen ingredients into a delicious, flavoursome soup. This was so easy to make and so so yummy – a real family crowd pleaser. it took 28 minutes on the chunky program, and it’s sorted our family for lunches and dinners for days. Soups are a great way to pack in those hidden veggies, so give a new recipe a try this winter and boost your family’s health at the same time. 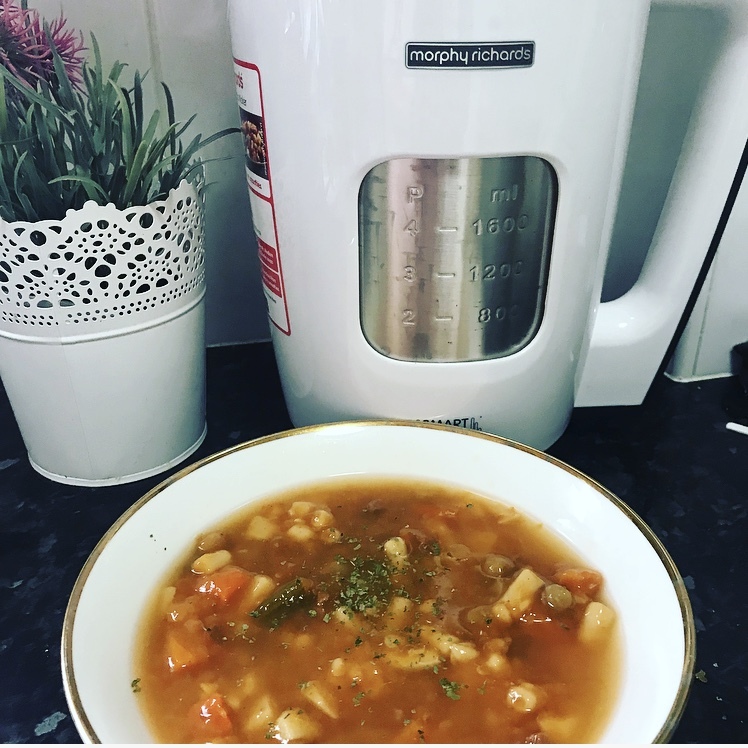 I’m dying to get more creative with my soups now I’ve got my Morphy Richards Soup Maker. Share your favourite soup concoctions in the comments. ** This soup maker was kindly gifted. I love soup in the colder months and this Soup Maker sounds Soup-er (lol) easy to make soup with. Haha! Oh my this sounds so delicious!! Soup weather is definitely coming, I need to try this! Yum! Now I have a hankering for Vegetable and Beef Soup. Mm - love soup for cold weather! This recipe looks great! I love a good soup, especially in winter. Umm how did I not know a soup maker was a thing before now?! Amazing!!! My name is Christina, I'm a married mum of 2 beautiful girls Madison aged 3 and Macie aged 1. I live in Sydneys beautiful inner west, I'm a cheerful, ambitious and enthusiastic person who loves going above and beyond in the call of duty and hope to pass this along to my kids. I love coffee, shopping and taking my girls to new and fun places. Im currently on maternity leave from my job as a bank manger and love being a mum to my beautiful girls and watching them grow and learn new things everyday.